The gift of cat cartoon art is a great idea for those of your cat-loving friends who love both cat art and cartoon cats. Cats are a favorite subject matter among cartoonists. Cats’ complex, mysterious personality and their graceful shape have inspired many an artist. No wonder cats appear in so many cartoons. There's Felix the Cat and Krazy Kat. There's Garfield and Sylvester. And many more. Indeed, cartoon art has steadily grown in popularity ever since cartoons were created. Cartoon art is definitely a wonderful cat lover gift idea. Posters and prints of famous cartoon cats such as Felix the Cat and Garfield are popular options. Other options include figurines and collectibles inspired by cartoon cats. 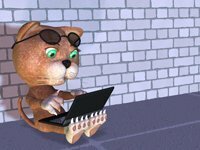 Thanks to the Internet many artists are also making available to the public new and original cat cartoon art. Cat cartoon art is an especially excellent gift for those who collect vintage memorabilia. Below you will find several wonderful ideas to help you choose the perfect gift. Bernard Kliban, an American cartoonist, became well-known for his cat cartoons. Maybe you've seen them, his cats have graced calendars, t-shirts, mugs, and holiday cards. Kliban is best-known for his book Cat, which was published in 1975. This book showcases a collection of cat cartoons drawn in the artist's unique style. Kliban's cats are bright, funky, and decidedly humorous. His cats appear in strange places, doing out-of-the-ordinary things. They walk their dogs, paint, try on tail covers, and much more. You can find several products featuring Kliban's cats, including books, magnets, and calendars. Of course, these make great cat lover gifts. Not sure what to give to that special cat lover on your list? Here are some ideas. Some are not strictly art gifts, but they make great cat gifts. Collectible items such as: mugs and decorative items portraying your favorite cartoon cats. Go to our cartoon gift ideas page for more suggestions. You can use your cartoons to create personalized gifts, too. As you can see, there are several options to find a unique gift that will delight your cat loving friends. Felix the Cat: One of the earliest cat cartoon characters. It is also one of the best known cartoons in the world. Silvester the Pussycat: Another beloved cartoon character best known for his lisp. Tom (from Tom and Jerry): Created by the animators William Hannah and Joseph Barbera. Heathcliff: Heathcliff is a fat, orange cat who first appeared in a comic strip created by George Gately in 1973. Garfield: One of the most popular cartoon characters, it was created by Jim Davis. It first appeared on June 19, 1979. For more information about these beloved cartoon cats go to our cartoon cats page.